Sears has a Rainy Day coupon available today! 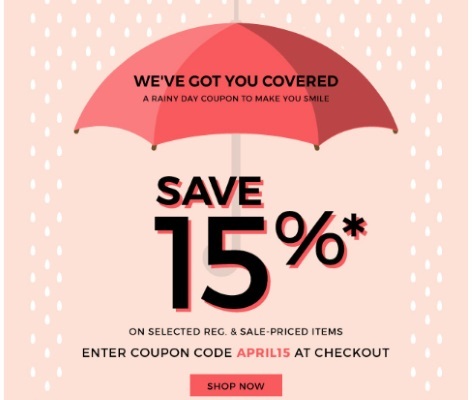 Save 15% off on selected regularly and sale-priced items. Excludes items with prices ending in .94, .91, .88 and .97, Clearance, Flash Sales, and Canada's Best items. Also excludes Juvenile Products/Baby Items, Major Appliances, Vacuums & Clothing Care, Patio Furniture/Decor & BBQs, Garage Door Openers, Gladiator® , Panasonic®, Magic Bullet®, SodaStream®, Nespresso®, Keurig®, Dyson®, iRobot®, Miele®, Rug Doctor ®, Samsonite® bliter3, Lift NXT, Pursuite DLX, Winfield 3 Fashion, Winfield 3 Promo, Ziplite luggage programs, Gift Card purchases, deferral or installment billing fees, protection agreements, delivery, installation and maintenance charges. Not negotiable, transferable or redeemable for cash. One coupon per purchase; cannot be combined with any other coupon code. Offer ends April 1, 2017, at 11:59 p.m. ET. Enter the promo code APRIL15 at checkout.